Do you like Wabbit: Mountain Madness? Share it with your friends. 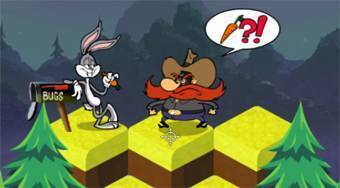 Wabbit: Mountain Madness is a very catchy perception jumping game in which your task will be to help a popular rabbit BUGS Bunny get back his beloved carrots stolen by bearded gunman Yosemite Sam. Jump from the top of the high hill, avoid obstacles, collect carrots and try to get down to the ground. Be sure to buy useful upgrades for your picked carrots at Coyote Store.